In The Road from Gap Creek, Robert Morgan returns to the Richards and Powell families introduced to us in The Truest Pleasure (1995), Gap Creek (1999), and This Rock (2001), offering the latter years of the marriage between Hank and Julie Richards through the narrative of their youngest daughter, Annie. In the generation that has passed since the end of Gap Creek, we learn that Annie’s brother, Troy, has been shot down in a flying mission in the European Theater of World War II. In recounting the effect of this loss, Annie describes how her family copes with want through the Great Depression and uncertainty through WWII, depicting the struggles of changing relationships and needs in a tight-knit community of close families. Annie explains how she has grown from an uncertain girl to a resilient woman as she comes to understand the complexities of these relationships. Shifting the narrative focus from Julie to her daughter, Annie, offers Morgan new creative opportunities. In Gap Creek, Julie defines herself by her capacity to work hard, necessary in her role as partner of her young husband, Hank. Isolated from their families and taking only small steps towards integrating with their community, the couple shares an innocence that further complicates their suffering from those who would take advantage of them and from the unexpected harshness of the natural world. In a manner, Julie precedes her husband in maturity and has to help Hank grow up; leaving home at seventeen and running a household taxes all her resourcefulness, and it appears at times as if she struggles with the world almost alone, relying on her faith and resolve. In discussing Gap Creek, Morgan jokes that Fred Chappell, after having read a draft, suggested the title Job Had It Easy; in these trials, Julie’s resilience makes her heroic. Annie, in contrast, benefits from community in a manner her parents do not. We see that in the intervening years between the novels, her father has become a much stronger man while her mother’s resilience has eroded. The family’s contact with the wider community has made them vulnerable to forces seemingly every bit as overwhelming as the elemental forces with which the newlywed Julie and Hank have had to contend. Further, because Annie has the luxury of a wider range of life choices, she must take more time to reflect on the meaning and relevance of those choices, options Julie as a young woman could not consider in her direr struggle for subsistence. Annie thinks of careers, resists the conventional expectations of love and marriage, and explores creativity in ways her mother cannot. Further, Annie’s tendency to philosophize marks a dramatic change in just a generation, from Julie’s “how?” to her daughter’s “why?” As the outside world has gained in its influence in Appalachian culture, Morgan’s making Annie responsive to the global context of her experience permits him to explore further the resonance of home and family. For all Annie’s independence, however, Morgan preserves Julie’s voice through Annie. Her first-person narrative relies on the same direct, expressive dialect that one finds in Gap Creek, with the slightest expansion of language one would expect in the change of generations. In Gap Creek, Julie speaks almost always in one- and two-syllable words, the longer words and abstractions almost all a product of what she has heard in church. With her high school education, Annie incorporates more abstractions in her language, but she relies on direct, concrete descriptions when she grapples to explain complex ideas, and the occasional dialect (“worser,” “taters”) marks her comfort in her descriptions. Like her mother, when Annie wrestles with big concepts like faith, motherhood, and love, she relies on her senses to describe what she experiences. As she grows in empathy, understanding, and appreciation, Annie’s earthy, direct narrative in The Road from Gap Creek offers the comfort of listening to the best family reunion anecdotes as Morgan couples his poet’s ear to his storyteller’s impulse. 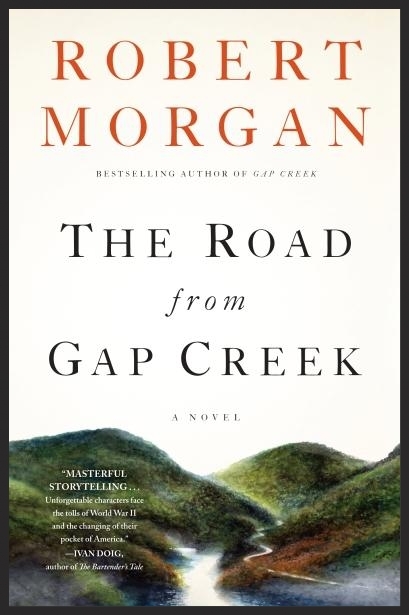 Nevertheless, The Road from Gap Creek offers Annie’s story, and, for all the social and emotional resonance it shares with Gap Creek, the events in this sequel remain distinct from Morgan’s previous works. Without question, my familiarity with Gap Creek deepened my appreciation for the new characters introduced in its sequel, but The Road from Gap Creek stands as a strong work on its own; it will welcome new readers to these engaging characters. Should Morgan decide to consider what happens to Annie’s family in the decades to come, I would welcome the opportunity to find that out, too. Thomas Alan Holmes, a member of the East Tennessee State University English faculty, lives and writes in Johnson City, Tennessee. Some of his work has appeared in Louisiana Literature, Valparaiso Poetry Review, The Connecticut Review, The Appalachian Journal, The Black Warrior Review, and The Southern Poetry Anthology Volume VI: Tennessee.